I am of the opinion that a strongly held viewpoint should be put regularly to the test. A few weeks ago I boldly stated on Instagram that I would never spend two (and definitely not three) figures on a single Galanthus bulb. Committed galanthophile though I am, I remain perfectly content with the charms of lovely G. nivalis, the common snowdrop that crowds our British woods and hedgerows at this time of year. The people who commented on that post agreed: most were happy to buy ordinary snowdrops, especially if on sale. Either that, or no one was confessing to any extreme snowdrop splurges in public. Nonetheless, questions and doubts remain in the back of my mind. There must be some reason that sane gardeners splash out relatively large quantities of money for snowdrop varieties that vary in often minute (read: undetectable) ways. What was it that I was missing? Rona Dodds, owner of Quercus Garden Plants, recently posted a piece on her Quirky Bird Gardener blog about the seven or so varieties that she grows, including a helpful photo of them side-by-side and crucially face-up. Arranged like this it was easy to see differences between them. One was chalice-shaped, another shaped like a stylish wind turbine. Inner splashes of green and yellow varied enormously, and double varieties threw a whole extra dimension into the mix. And yet, when we view snowdrops in the garden or in the wild, we don’t see them face up, we see them from above and often from a distance, tepals pointing downwards with all the inner intricacies hidden from sight. For me, the beauty of snowdrops has always been in their plurality. What could be more breathtaking than the sight of a woodland naturalised with those countless tiny white heads devoutly nodding together like a congregation praying for spring? And so every year I go snowdrop hunting. Not just to the woods and fields close to Edinburgh, but also to gardens that showcase unusual varieties of snowdrops. I like to look at the different varieties on display and try to spot the differences. Some are easy to notice, others need a trained eye. I also like to look at the prices if varieties are on sale, and if I am with someone else I like to point the prices out to them and enjoy the ensuing debate. ‘What, £28 for a single bulb?’ my companion will inevitably gasp. ‘But it looks exactly like all the others.’ And so far I have not yet advanced far enough in my galanthophile training to counter their astonishment with a sturdy defence of the prices. Only two special Galanthus varieties have ever stopped me in my tracks. One is G. ‘Primrose Warburg’ (£18 a bulb), a delightful little yellow variety, recognisably different from the common snowdrop to even the rookiest observer by its little yellow topnot (though I can’t distinguish it from G. ‘Wendy’s Gold’). The other is G. ‘Daphne’s Scissors’ (£8 a bulb) which has a sweet little pair of scissors marked on the inner segment. Both of these I saw first at Shepherd House Gardens and are still on my mind a year later. Snowdrops are celebrated each winter during the snowdrop festival at the Cambo Estate in Fife, just across the water from Edinburgh. Cambo is home to the national snowdrop collection. As well as 300 special Galanthus varieties, their 70 acres of beautiful woodland is home to endless G. nivalis that wander as far as the eye can see. According to Cambo’s website, members of the Erskine family, who have lived and gardened at Cambo for generations, would spend hours digging, dividing and replanting the snowdrops across the woodlands in order to create the impressive colonies we see today. A couple of weekends ago I took my sister to Cambo with me to admire the naturalised woodland snowdrops and the fine collection of specials, and to have fun gasping at the prices of those on sale. Before heading for the woodland walk, we took a quick tour around Cambo’s famous walled garden, with its naturalistic planting of grasses and tall perennials, its lovely glasshouse with stained glass panel, and its gentles slopes running down to the little brook that bumbles merrily through the middle, traversed by three pretty bridges. The walled garden had an air of dormancy, a sleeping beauty. I had some fun taking shots of the perennial seedheads that had been left standing to such good effect, and vowed to return in summer when it will be at its best. The woodland snowdrop walk was everything it promised to be. Acres of venerable old trees had beneath them vast undisturbed expanses of snowdrops (I’m trying not to use the word ‘swathes’ but it’s hard). They grew thickly alongside the paths, down to the brook and away into the distance where they merged to give the impression of far off snow. In some places they were interspersed prettily with yellow Eranthis hyemalis, the winter aconite. The woodland path, satisfyingly mossy at the edges as most Scottish woodland paths are, ran down to the seaside about half a mile away, where children were clambering on the rocks and the landscape briefly joined forces with a golf course. The route circled on a lower streamside path back to the big house and the snowdrop collections. Cambo’s display of special snowdrop varieties began in a long raised bed at the side of the house, and continued in the beds leading into and around the delightful little winter garden, filled with hellebores, iris, and fiery red dogwoods. Most were labelled (some labels were missing or unclear). In their close groupings, it was easy to see that some varieties were taller, or fatter, or more dainty than others; some had sharp, pointed tepals, others rounded. To choose a favourite would be impossible. These were not snowdrops to be naturalised in a corner of the garden; they were a true collection: to be possessed and categorised and labelled and displayed, part of their value being in their membership of the divisible whole. There is no point in owning just one or two specials. A collection by definition needs to contain as many varieties as possible, and it also needs to be expanding; there is no satisfaction in owning a static or dormant collection. Once a collector gives up his hunting and accumulating and sorting, he may as well sell the whole lot off. But there’s another, more abstract, part of the truth. It’s to do with two differing ways in which we humans observe and consider our environs. Some people are very interested in detail. They are the pointillists, the people who might buy a shirt not because it goes with anything else but because of the intricate pattern of tiny birds on the fabric, the people who follow a recipe to the very last gram or who notice every tiny bit of dirt missed by the cleaner. These are the collectors, the true Galanthophiles, the clever people who know their snowdrop markings well enough to spot a new hybrid popping up in the garden. But the other type of person is the painter of broad brush strokes, the person who is more interested in the overall impression, who has a sense of the bigger picture but forgets to notice the detail, or who would rather feel the pervading atmosphere than get down close with a magnifying glass. Not for us the tiny markings of special varieties. We just want our swathes. Bright red Cornus (dogwood) in the winter garden with Bergenia and grasses. This is not to say that I shan’t some day be persuaded to start my own special collection of Galanthus. Even as I write this and check the internet for my facts on prices and varieties, I feel my opinion changing as I stumble across pages with photos of unusual and beautiful snowdrops. Each year I will continue to take stock of my viewpoint by visiting places with fine collections of special snowdrops, and I already know which two varieties will be the first to make a dent in my pocket. But that won’t happen until I have a bigger garden, one with space for a collection worthy of the name, and one that I know I will be gardening in for the foreseeable future. The Cambo Estate is at Kingsbarns near St Andrew’s in Fife, KY16 8QD. The Snowdrop Festival is on until 11th March and costs £5.50 per adult (children free). Thank you Gareth – it was special indeed. This is a wonderful post Joanna! The photos are gorgeous and although I will probably never be that way in March I would love a visit to this garden. I know I was supposed to be admiring the snowdrops (and I did, really!) but the one photo that really stood out for me was that Cornus, Bergenia and grass (Carex?) combination which I am definitely going to copy in my next garden! Loved the greenhouse photos and the seedheads too. 🙂 Thanks for sharing! I am not sure what the grass varieties were – grasses are something I am yet to get into properly and I’m afraid I don’t take enough notice of their names, just their overall effect, which I often admire (those swathes again!). Cambo is said to be beautiful at any time of year, so worth visiting anyway if you are ever in the area during a different part of the year. The walled garden will be beautiful in summer and I do mean to go back and see it at its height. I would also be interested to see how the winter garden looks in summer! Thanks, Joanna, for this great post!The photos are stunning. Thank you Anca, I am so glad you enjoyed it. Wow, that is absolutely beautiful. My limit is £10 per bulb top whack and then only one or two a year. Very expensive mouse food. Thanks for identifying the scarlet elf cup. I found some of that here the other day and didn’t know what it was. I had no idea about the scarlet elf cup either, but rather optimistically wrote ‘red cup fungus’ into Google and it knew instantly what I meant. Yes, expensive snowdrops are for mouse-free gardens! Not just for the financial cost of losing them, but the heartbreak too. Oh Cambo must be a fabulous place to visit Joanna. I would like to see that stained glass window close up. Such great detail especially that little snail. By the way the special that you have suggested is ‘Wasp’ isn’t ‘Wasp’ although I can’t tell you which variety it is 🙂 I think that you will find that most galanthophiles love swathes just as much as specials. Thank you Anna. I confess I had to go back and see which snail you were referring to, but couldn’t find one. Please let me know! Thank you also for mentioning the ‘Wasp’ that isn’t a ‘Wasp’. It was labelled as ‘Wasp’ so I’m afraid I couldn’t comment either way. How interesting. I also loved the snail … in the spectacular stained glass panel. P.S. I meant to ask which are the two varieties that you’ve set your sights on for that point sometime in the future? ‘Primrose Warburg’ and ‘Daphne’s Scissors’. I’m happy with the common variety. I have to have things that fend for themselves and I wouldn’t be too upset if I lost them. But, it is easy to enjoy the collections belonging to others! Beautiful photos, Joanna. These are beautiful! It looks like you had a great day out. I love those seedheads – they are very well photographed. I agree with Eliza: I enjoy the collections of galanthaphiles, but wouldn’t want to be charged with their care. 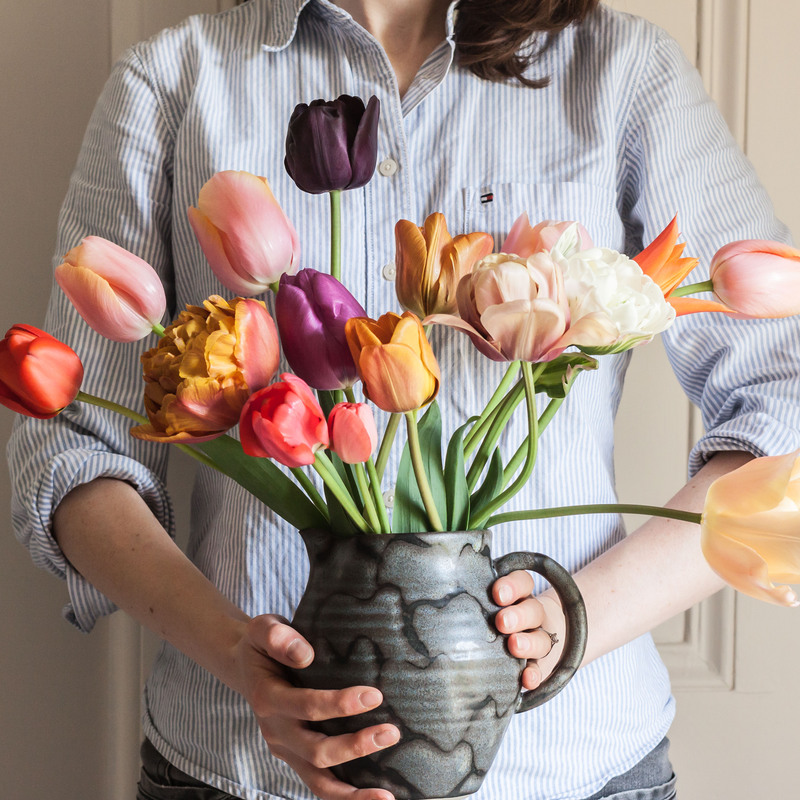 I think I’m a swathe person with snowdrops, but a detail person with tulips, peonies, roses and dahlias, and I have very greedy tendencies for collecting those! At least with those plants the differences are more obvious and most varieties cost relatively little! I do enjoy trying new tulips every year, although as time goes on I find myself clinging on to old favourites too. I am quite sure you are right, Amelia, and of course do not pretend that some day I shan’t become a raging galanthophile of the collecting type. I certainly agree that I would be interested in finding a variety that appears a little earlier, say early January when my ebb needs a boost. Magnificent photography for winter! The ‘Scarlet Elf Cap’ is a miniature beauty. I don’t have ‘Daphne’s Scissors’ I’ve had the chance but somehow just passed on the opportunity. Nor have I ever even heard of the Cambo Estate. I’ll visit next time we are in your area. Looks great. Thank you Ian – the Cambo estate is truly worth a visit for any galanthophile. What a lovely walk with you through this winter garden. My favourite image though is your last with those elegant, dainty bright little lampshades beautifully contrasting with the green velvet. And what swathes Cambo provides! What is that mightily-berried shrub? It’s something evergreen, yes? Few woody plants with bright and persistent berries look so fresh and intensely colored by the time snowdrops get going, much less have green foliage. It is interesting that the berries have not been touched by the birds. Our (small leaved) cotoneaster at home was stripped bare this harsh winter. My aunt placed two of this type of cotoneaster as standards in pots either side of her front door. It was a most effective Christmas alternative to holly. Oh Cathy, what a generous offer, which would be most churlish to refuse! Might I defer your kind gift by a couple of years though as we will probably move within that time-span and I would die of shame if I lost them. I took about twenty snowdrop bulbs from my old garden to the current one and they multiplied enormously quickly. Not only do the bulbs divide, but the self-seeding has been prolific too. Quite wonderful!